Over 3,600 companies exhibited the newest and greatest in natural and organic foods and products at one of the world’s largest trade shows. I thought about this quote a lot in the last couple weeks. In early March, I traveled to Anaheim and attended the 39th annual Natural Products Expo West, the world’s largest trade show focused on natural, organic and healthy food and products. Though Expo West was a whirlwind of people (over 86,000 people from 136 countries attended!) and programming over five jam-packed days, one clear theme emerged from all my conversations: that business could — and should — be used as a force to advance social and environmental causes. I was fortunate enough to attend Expo West and meet leaders like Chouinard through the support of the Social Enterprise @ Goizueta (SE@G) and a program called MBArk. Now in its eighth year, MBArk (pronounced “embark”) brings together cohorts of progressive business school students and sends them to large trade shows to explore careers in sustainability, entrepreneurship and food. This year, I met up with 53 other students from top MBA programs around the U.S. for a full suite of programming centered at Expo West. The MBArk program included networking opportunities, including dinner with MBArk alum, happy hour with General Mills executives and breakfast with 40-plus CEOs. 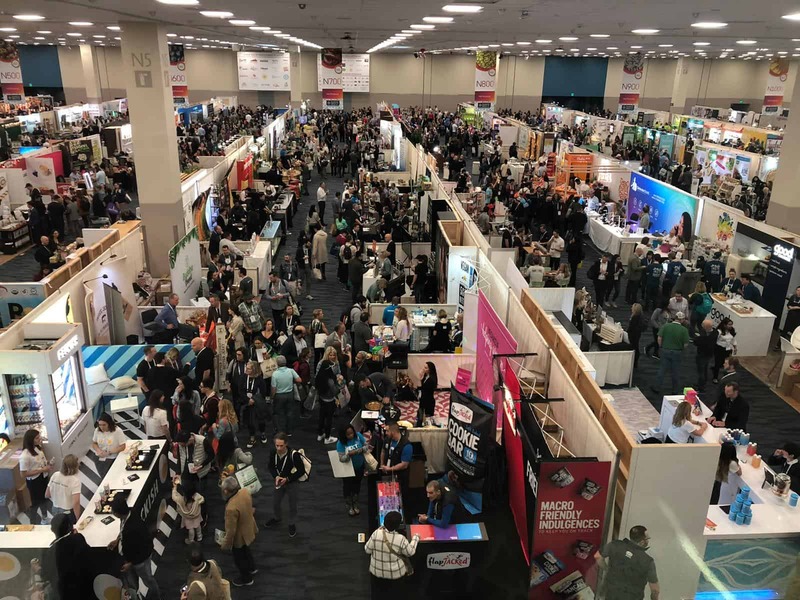 With other MBArk participants, I attended numerous booth visits, which were designed-for-us opportunities that allowed deep-dives into specific companies such as Zupa Noma, KeHe, Honest Tea, Beyond Meat, Daiya, Clif Bar and Zevia. Finally, we also attended themed panels around e-commerce (hosted by Thrive Market) and sustainability (Dr. Bronner’s and General Mills). In between these MBArk sessions, the other participants and I would take advantage of the programming Expo West had organized directly. A few highlights included daily morning yoga, Climate Day (a full day of panels focused on climate change and the approaches companies are taking to reduce packaging, use renewable energy and support regenerative agriculture), and of course, exploring the booths and sampling new products from the 3,600 companies present. 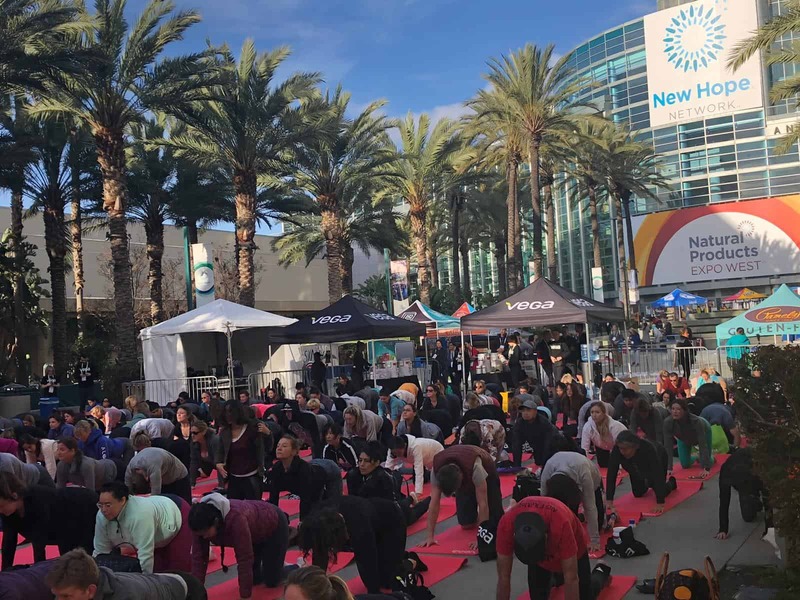 Each day of Natural Products Expo started with optional morning yoga outside the Anaheim Convention Center – a great way to warm up the body before full days of sampling foods, networking, and hustling from one hotel to another! 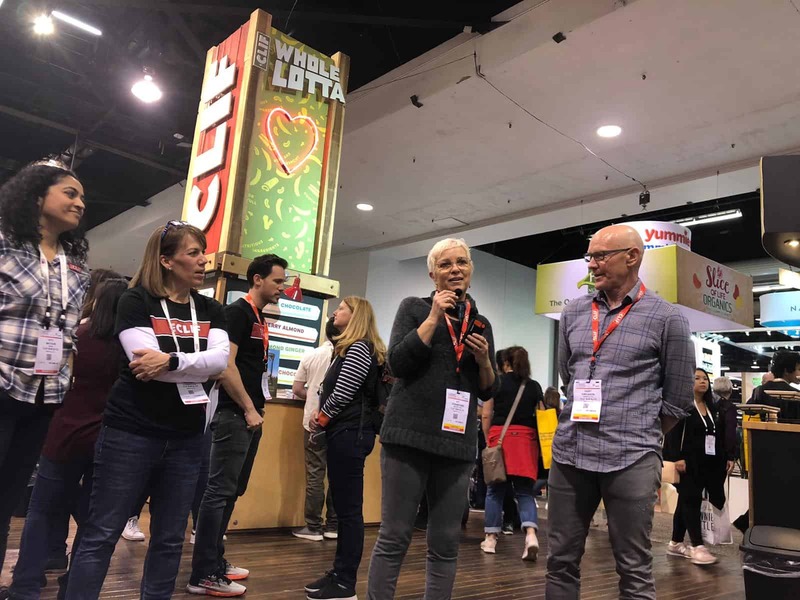 More broadly, Expo West showcased real-life examples of businesses that yielded both financial profits and a wider societal impact. For instance, co-founder and co-CEO Nick Green spoke to the MBArk program about his vision for Thrive Market, positioning it as an online platform meant to expand organic and healthy food access to more Americans. CEO of Zevia, Paddy Spence, explained how his products provided people with a healthier soda alternative that was naturally sweetened and contained zero calories. Gary Erickson and Kit Crawford, the husband and wife co-owners of Clif Bar, speak with MBA students about building capacity in sustainable supply chains by funding organic research and sharing best practices with other CPG companies. After Expo West, I’m left with a sense that business leaders can and should take a larger, systemic view around the impact they have on social and environmental issues. I’m also left with questions around the limits of their role. As someone with academic and career experience in public policy, I’m aware of the critiques around conscious capitalism and its assumptions of privilege: you still need a fair amount of education, disposable income, and leisure time to understand, research and buy organic products. 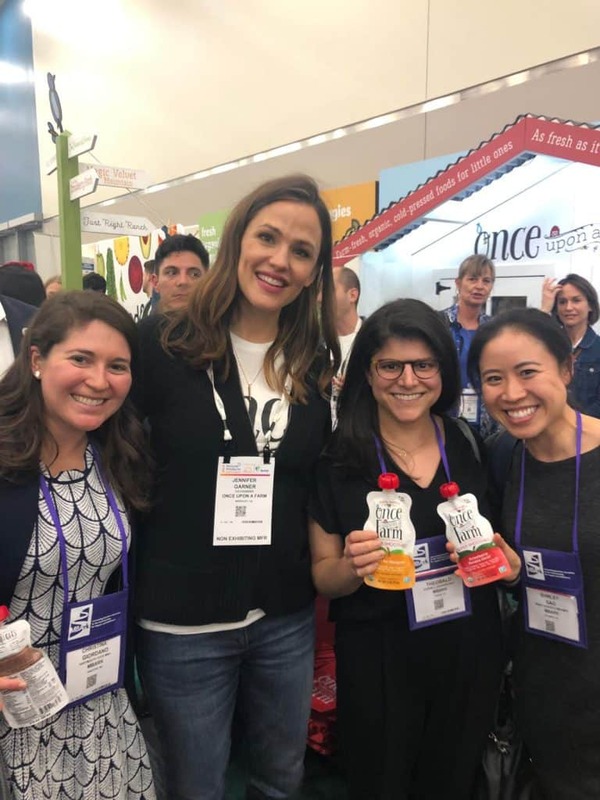 Jennifer Garner, co-founder of cold-pressed, organic baby food brand Once Upon a Farm, stopped by the expo floor to greet fans. Most thought-provoking for me, though, was the limited conversations at Expo West around the role of policy in creating lasting, systemic change. A few companies referenced how they used their platforms to encourage their consumers to support progressive political causes and/or pressure government to take action; these included Brenna Davis, VP of social and environmental responsibility at PCC Community Markets (a Seattle grocery store), who spoke during Climate Day about using store newsletters to educate consumers on local political campaigns. In the future, I’m hoping to further explore (1) other companies’ initiatives in this policy-influencing arena and (2) a policymaker’s perspective (whether local, state, or national) on the role of business. For instance, I’d love to see a one-to-one conversation between an executive and policymaker who have worked together on regulations pertinent to the natural foods and product industry, or a stand-alone policymaker talk that highlighted how a business changed their mind about advancing certain policies. In the end, I came away from Expo West with new friends, industry contacts, enough samples to last me the month (how could I not mention that?!) and plenty of food for thought (pun completely intended). I’m eager to use my newfound knowledge and relationships to be that much more aware of not only what I consume and what I see on grocery shelves, but also the opportunities to reformulate conventional business structures and assumptions to advance social and environmental causes. Shirley is a 20MBA/MPH student interested in building healthy environments where people may thrive. At Goizueta, she is focusing on building her financial and data analytical toolkit to harness the power of private sector companies towards this goal. She holds a Bachelors in Public Policy from Princeton University and has previously served as the Managing Director of Partners in Health-Sierra Leone and as a health care consultant within Deloitte’s Strategy and Operations practice.